Satanic Bay Area took part in the annual tree decorating at San Jose’s Christmas in the Park event Friday morning, but by Monday, the group said a number of its decorations were missing — enough so that a group member had to redistribute the ornaments to cover up the losses. The group is expecting to have to add more ornaments before the event concludes on Dec. 25. 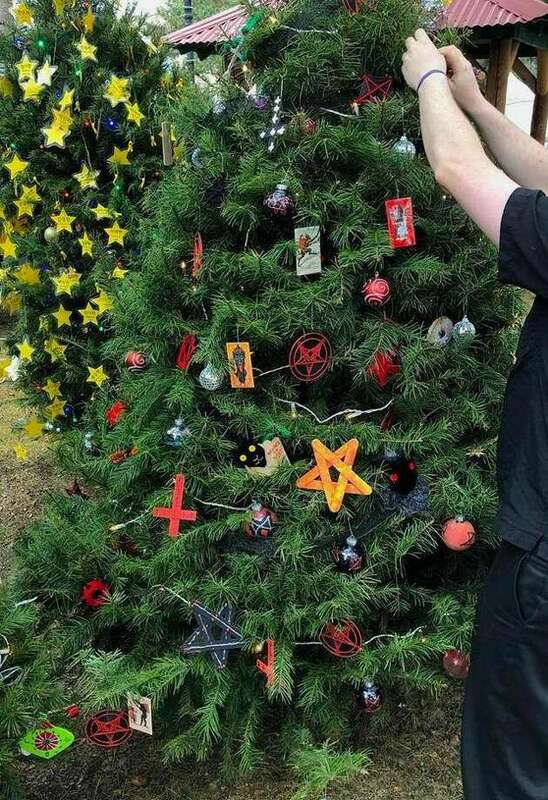 “Ornament theft is a thing that happens at Christmas in the Park, unfortunately, and we even anticipated that ahead of time,” said Satanic Bay Area organizer Daniel Walker. “I don’t want to say we don’t mind, because it is annoying, but at the same time, [theft] is a fact of life. I was a little taken aback when I got the message today saying, ‘Hey if this keeps up, we’re going to have to make some new [ornaments] in about two weeks or so, it’s gonna run out if the [theft] rate doesn’t get down.’ That I did not expect. “It’s really less a question of the act itself, it’s more a question of the rate at which it appears to be happening,” Walker added. Still, Satanic Bay Area is taking the theft in stride. Other groups have offered to chip in with new ornaments, and members have said they would make more decorations to add to the tree. Walker called it “a good opportunity to rally together” in the face of the thefts. Despite the missing ornaments, according to Walker, the group doesn’t feel the theft was necessarily directed at them, and said organizers and attendees were “mostly positive” when they were decorating their tree. Walker typified the response to the tree as anywhere from “hilarious to baffled to amused,” with just one member reporting witnessing “one or two people who complained” about the tree.